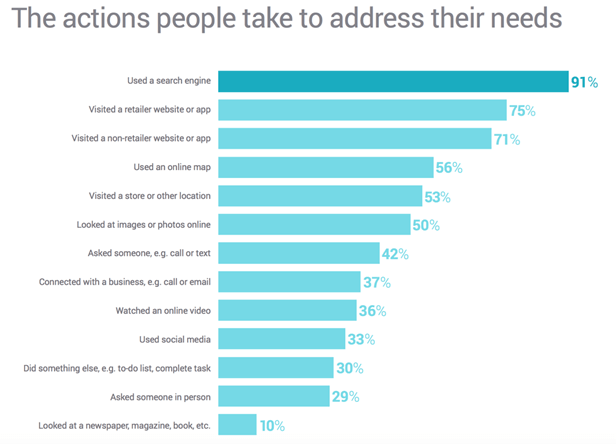 According to Google, when people have a question, 91% of people turn to their smartphone for help. Search has always been used for completing work like a class project or finding a dinner recipe, and now it has made its way to mobile shopping. Think of a time when you need to make a purchase for your house, what was the first step that you took to learn more about the product? Did you go to the store first, then ask a sales person, or done all the research at home using your smartphone while sitting on the couch watching Netflix on your computer. 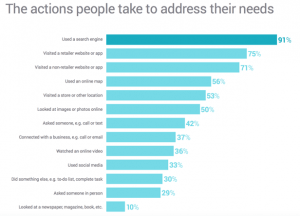 Most of you would probably have done the latter and that is not surprising as 70% of people who made a purchase in a store first looked up the information they needed on Google Mobile Search before stepping into the store. This graph shows the resources mobile users used to fulfill their shopping needs. With the number of smartphone users around the world increasing and the fact that most of them turn to Google Mobile Search prior to making a purchase, it is extremely important to make your website mobile friendly and make a good first impression on your potential customers.